Do you own and operate a business in Northern California? Have you considered making the switch to solar power so you can save money on utilities and invest the extra cash into your business? You’re not alone. Thousands of businesses in and around San Jose are choosing renewable and alternative energy over traditional power to run their businesses—it’s no surprise with the ever-rising energy costs across California. 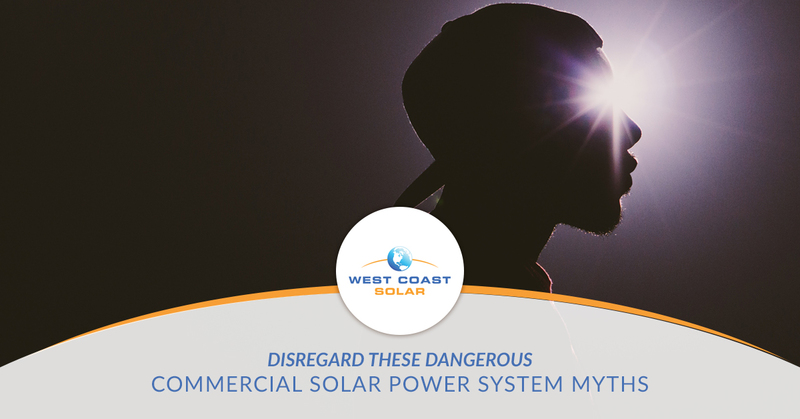 In this post, we’ll be sharing seven dangerous myths that solar companies in San Jose desperately want their potential customers to disregard. Solar energy is a great way to save money, invest in the future, and help the environment. Not only will you be helping yourself, but you’ll be helping the community. Making the switch to solar is a great move for you, the community, and your brand! If you’re ready to discuss installing a commercial solar power system for your business, give West Coast Solar a call today! Otherwise, continue reading to learn about some dangerous myths. Commercial solar power systems are relatively new to the national market. In the last two decades, they’ve become more popular. Nonetheless, some rumors and myths have been circulating that we want to address. This is simply not true. Commercial solar energy systems are, in most cases, more affordable than residential systems. What does this mean? Financing options, incentives, and tax credits are available to businesses who make the switch to solar power. Not only does your business benefit from renewable energy, but so does the entire world. You’re doing more than saving money; you’re positively affecting everyone else. Once again, this is not true. A solar power system that covers 50 percent of your electric bill is still worth it. Why? Consider saving 50 percent on your electric bill. How much is that? Even if you’re saving a percentage on electricity, it’s still an amount you can use elsewhere in your business. Furthermore, you won’t only be saving money. Producing energy through solar reduces your carbon-emissions, which helps the community, too. It does take a lot of work to design and install a solar power system, but that’s why you need to find one of the best solar power companies in Northern California to do it for you. When you partner with a full-service company, you simply need to communicate what you want, attend a few meetings, and secure financing to pay for the system. Otherwise, the solar installer takes care of the rest for you. Solar systems have little to no moving parts, which reduces the chance of failure or malfunction to almost zero. Furthermore, a system is installed to last decades, providing your business with reliable, effective energy. In a large majority of cases, this is not true. Those financing a system may find that the “levelized” price of electricity over the lifetime of their system attractive, but consider how much you will save if you purchase the system outright. You pay up front, but as you gain the return on your investment, it relies on how much you save not paying for the current cost of electricity instead of paying less than the current cost. You’re on a whole different level with your investment. You could hire someone with a P.h.D in sustainability and a Master Electrician, but you don’t have to. In most cases, the best solar companies in Northern California will offer maintenance and repair services post installation. Furthermore, if you do your due diligence and obtain a warranty, then you can use it to cover any rare cases of major damage or malfunction. This is one of the biggest myths in the solar industry. Studies at Lawrence Berkeley National Laboratory showed that homes with a solar power system sold more often than those without. Although a study for commercial buildings has not been completed, consider this question: If searching for a building to lease/purchase for your business, would you prefer to have one that has no electricity bill due to having a solar power system, or one that has the traditional electricity bill? I hope the answer is obvious, but we’ll make it easy for you. Go for the building with the solar energy system included. At West Coast Solar, we’ve been servicing San Jose businesses with solar design and installation for years. We know what it takes to help you make the switch to solar power. If you’re ready to discuss potential solar energy options, give us a call today!